The AD8607 is a dual micro-power Rail-to-Rail input and output Amplifier featuring very low offset voltage, low input voltage and current noise. These Amplifiers use a patented trimming technique that achieves superior precision without laser trimming. All are fully specified to operate from +1.8V to +5.0V single supply (or 0.9 and 2.5V Dual Supply). 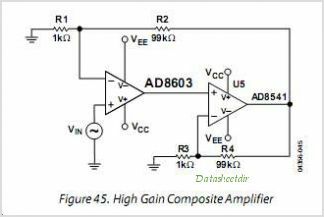 The combination of low offsets, low noise, very low input bias currents, and low power consumption make these Amplifiers especially useful in portable and loop-powered instrumentation. This is one package pinout of AD8607,If you need more pinouts please download AD8607's pdf datasheet. This is one application circuit of AD8607,If you need more circuits,please download AD8607's pdf datasheet.